The Launch of this vessel was attended with circumstances of more than common interest. It is not usual to launch vessels of any class in any considerable degree of completeness, but only in such a forward state that they can afterwards be rigged, fitted up and made ready for sea, and finished after a considerable time. In this instance, however, the Titania was completed for sea on her stocks. 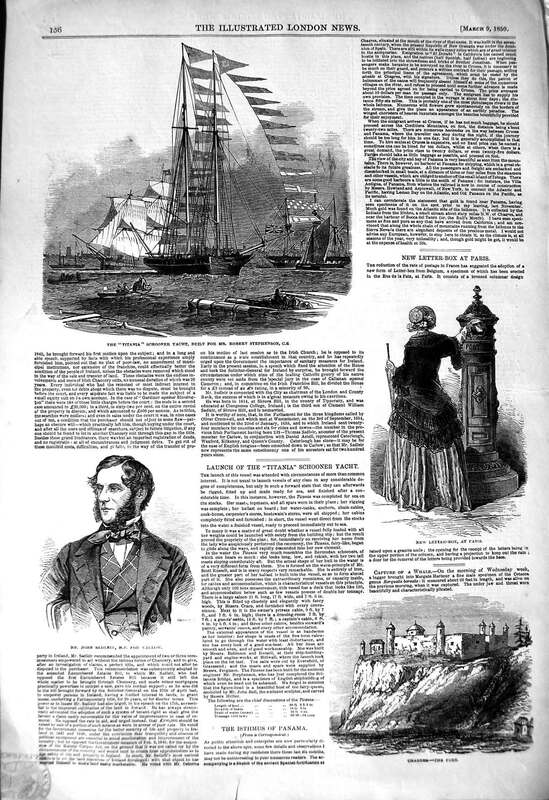 Her masts, topmasts, and all spars were in theur place; her rigging was complete; her ballast on board; her water-tanks, anchors, chain-cables, cok-house, carpenter's stores, boatwain's stores were all shipped; her cabins completely fitted and furnished; in short, the vessel went direct from the stocks into the water a finished vessel, ready to proceed immediately out to sea. To many it was matter of great doubt whether a vessel fully loaded with all her weights could be launched with safety from the building slip. But the result proved the propriety of the plan.